Where in the World is Mrs. Fucoloro? : Liar! Buon Giorno! Since we are off tour, we had to get our own breakfast for the first time in ten days. We walked from the St. Regis to Piazza Della Republica and onto Via Nazionale, where we found an Irish Pub and had breakfast. Since it is Sunday, there weren't any Tobbachi's open that early. After breakfast, we went back to Vatican City and surrounding area to do a little shopping. Mailed a postcard from Vatican City. Apparently, Vatican City sends their mail to Switzerland to be processed. Italy's mail system if supposed to be unreliable. Had a gelato at an outdoor cafe and off to keep our reservation at the Borghese Gallery. The Borghese Gallery is considered by many to be the best private art collection in Italy. You are only allowed to stay in the gallery for two hours. We were joined on our visit by a celebrity, but you will need to click on this picture to read who joined us. Very nice tour, but Laura and Dad were disappointed in the garden. 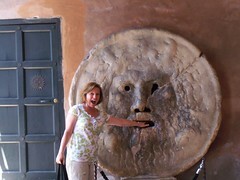 Back to the hotel and off again to La Bocca della Verità or "The Mouth of Truth." The sculpture is thought to be part of a 1st century ancient Roman fountain. The most famous characteristic of the Mouth is its role as lie detector. Starting in the Middle Ages, people believed that if you told a lie with your hand in the mouth of the sculpture, it would be bitten off. The sculpture was placed in the portico of the Santa Maria in Cosmedin in the 17th century. This church is suppoed to contain relics of Saint Valentine. It was a beautiful church in need of repair. Back to the hotel for rest and relaxation. Tonight, our final dinner in Italy.